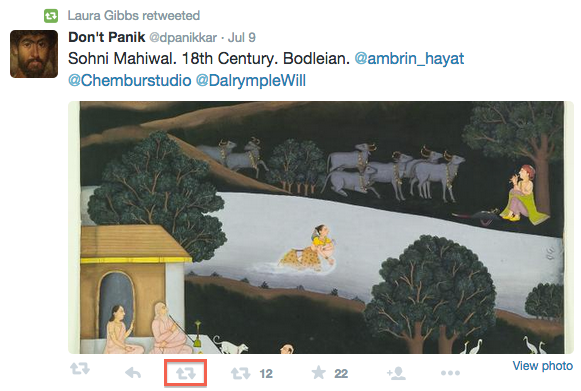 One of the ways that the Twitter network adds value to all those tweets is through the power of the RETWEET. When you reshare someone's tweet, you are letting people know that this is something worth sharing, something of value. Just how you strike a balance between your original tweets and your retweets is totally up to you, and BOTH original tweets AND retweets are adding value to the system. When you retweet with the standard Twitter button, you are prompted to add a comment. This is a newish feature at Twitter (summer of 2015), and it is really fraught with peril: I do NOT recommend it. Details here. So, for example, if you want to add a hashtag, you can do that! For me, this is the single best use of the Classic Retweet extension. By adding a hashtag to a retweet I add even more value to that tweet, making it discoverable by even more people who will see the tweet now in the stream for that hashtag. If you make more extensive edits to the retweet, you can always change the RT at the start of the tweet to MT, "modified tweet." 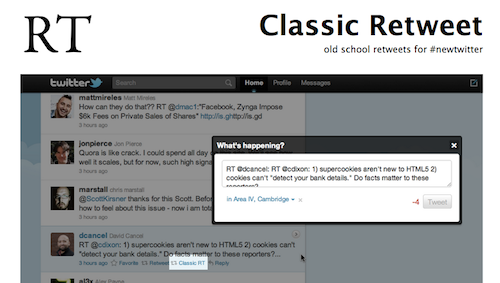 To find out more, here is additional information about the Classic Retweet Extension. Highly recommended! Student Blogging - who are they writing for?